We all aspire to live more compassionately, to be able to go through life with a more open and loving heart–and with this series of universal and time-tested exercises, that’s exactly what you’ll be able to do. Beginning with the crucial step of first inviting love in, we can learn to connect to an endlessly renewable resource of compassionate energy. And when we do that, we can develop the strenth and courage to act skillfully and with kindness even in the most challenging of situations–and with the most challenging of people. 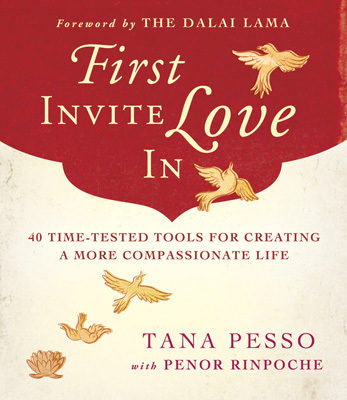 First Invite Love In: 40 Time-Tested Tools for Creating a More Compassionate Life . Tana Pesso holds an undergraduate degree from Harvard College and a master’s degree in public policy from the Kennedy School of Government, Harvard University. She lives in Rockport, MA. Penor Rinpoche was the head of the Nyingma school of Tibetan Buddhism. Born in 1932 in Eastern Tibet he was renowned by all as an exemplary master of the Tibetan tradition. He tirelessly taught devoted students around the world. He passed away in 2009.